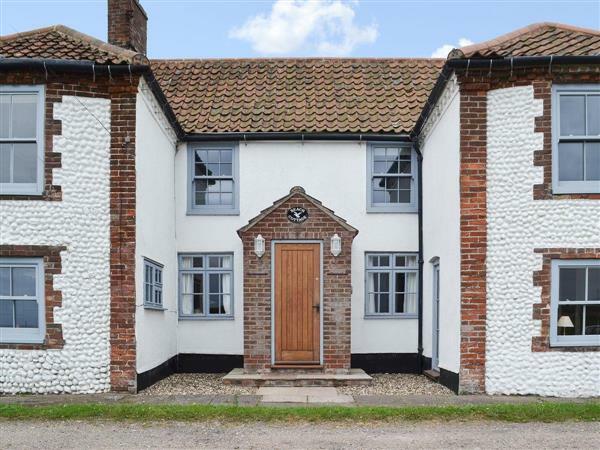 Beach Cottage in Cley next the Sea, near Holt, Norfolk sleeps 8 people. Beach Cottage near Holt has whitewashed walls and striped floors which just seems to say ’seaside’. With uninterrupted views across Cley Marshes, this terraced cottage was formerly two fisherman’s cottages and has now been renovated with loving care by the owner, who has retained its light and airy rustic style. There is a cosy living room with a wood burner and a separate snug. Whether you choose to sit on the garden terrace and enjoy the views across the beautiful marshes or inside the cottage itself, you will always find somewhere to relax and unwind. Cley next the Sea itself has lots of amenities with artisan places to shop, eat and drink, or venture further and you will find a coastline littered with a string of pretty coastal towns and villages offering a variety of wide sandy beaches, shingle beaches, marshes and pretty quays. With Cley next the Sea beach just a few hundred yards from Beach Cottage, you can even enjoy a day by the sea on foot. Golfers can head west to Brancaster or east to Sheringham or Cromer. Birdwatchers will be spoilt for choice and will find the Cley Marshes Visitor Centre just a short walk away. Walkers and cyclists will find an abundance of picturesque coastal routes right on the doorstep, and having worked up an appetite, you will be delighted to discover North Norfolk’s emerging ’foodie’ reputation. The beach is 600 yards from Beach Cottage near Holt. With the shop ¼ mile, and the pub & restaurant are 200 yards from Beach Cottage. Beach Cottage near Holt has a step to the entrance. Living/dining room: With wood burner, 32 Freesat Smart TV, DVD player and beams. Kitchen: With electric oven, electric hob, microwave, fridge, dishwasher, washer/dryer and tiled floor. Electric heaters, electricity, bed linen, towels and Wi-Fi included. Initial logs for wood burner included. Welcome pack. Courtyard with lawned area, raised terrace and garden furniture. On road parking. No smoking. Please note: No children under 5 years old, except babies under 6 months. There are 6 steps to the terrace. Holidays at Beach Cottage run from Friday to Friday. For a better idea of where Beach Cottage is, you can see Beach Cottage on the map below. Beach Cottage is in Norfolk; should you be on the lookout for a special offer, you can find all the special offers in Norfolk. It's always worth checking to see what is on offer at the moment. Do you want to holiday near Beach Cottage (UKC2071), you can see other cottages within 25 miles of Beach Cottage; have a look to find your perfect holiday location.